Lemurs and monkeys, along with apes, are primates. Most primates live in trees, but a few live on the ground. We’re classified as primates, too, but you probably live in a house, not a tree! 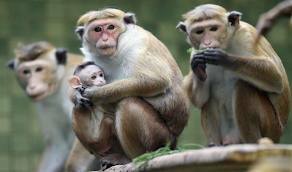 Primates usually live in groups and have families. Primates are more like humans than any other animal. Most of them have hands like ours. They can grasp trees and open things. All About Lemurs and Monkeys: The mandrill monkey has a white nose and a long mane. This is the type of monkey in Disney’s movie, The Lion King. Primates use screeches, howls and screams to communicate with each other. The howler monkey is the loudest land animal on earth. Lemurs and monkeys are omnivores. That means they eat both plants and meat. They mostly eat plants and fruits, but sometimes they eat bugs. Yuck! 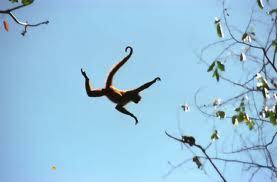 A Spider Monkey has long arms and legs. Lemurs have been around a long, long time. In fact, they are the oldest primates. They are sometimes called prosimian, which means pre-primates. 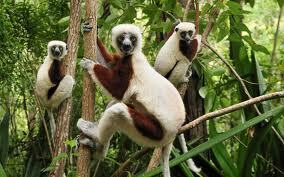 They live only on the island of Madagascar. Monkeys are smart and curious. They like to swing through trees by using both their hands and their tails. The mouse lemur is the smallest lemur. The smallest lemur is the mouse lemur. It weighs as much as a cracker. The biggest lemur is the indri lemur. It’s the size of a cat. One girl lemur is usually the boss. She gets to choose her mate and eat first. The mandrill monkey has a white nose and a long mane. This is the type of monkey in Disney’s movie, The Lion King. 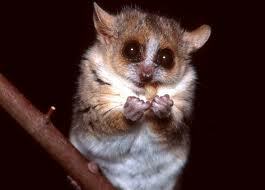 A bushbaby is a small primate. It sleeps during the day and goes out at night. It has huge eyes to help it see in the dark. Capuchin monkeys are really smart. They can use tools and learn new skills. Monkeys show affection by grooming each other. The Pygmy Marmoset is the smallest monkey in the world. It is 4 to 6 inches long. It weighs about as much as an apple. A documentary video about how lemurs use millipedes to protect themselves from mosquitoes. Question: What is the difference between a monkey and an ape? Answer: Monkeys have tails; apes do not. Question: Where do monkeys live? Answer: Old World monkeys live in Africa and Asia. New World monkeys live in South America, Central America and Mexico. Question: How do monkeys eat bananas? Answer: Just like we do – by peeling them! Enjoyed the Easy Science for Kids Website all about Lemurs and Monkeys info? Take the FREE & fun all about Lemurs and Monkeys quiz and download FREE all about Lemurs and Monkeys worksheet for kids. For lengthy info click here. Declan, Tobin. " Facts About Lemurs and Monkeys for Kids ." Easy Science for Kids, Apr 2019. Web. 21 Apr 2019. < https://easyscienceforkids.com/all-about-lemurs-and-monkeys/ >.